$130 – $160 Check online availability for rates applicable to your preferred dates. 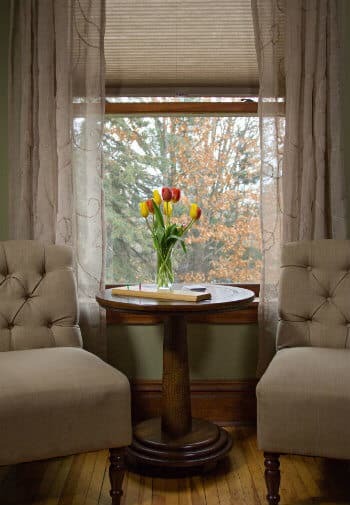 Elisha’s Room is located on the second floor of the Main House and has sunrise-facing windows for breathtaking views. With its serene green walls and beautiful hardwood floors, this room offers simple, yet comfortable accommodations. 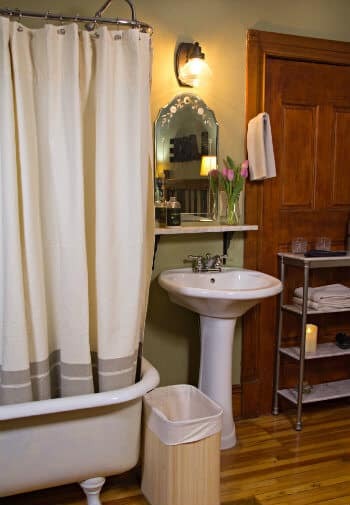 Guests can enjoy a queen bed, two chairs, and a private bath with claw-foot tub and shower combination. Elisha’s Room is the perfect place to return after a day of adventures in the Bayfield, Wisconsin area. Maximum two people in this room. The rates include full breakfast along with all of the Pinehurst Inn Bed & Breakfast amenities. Be sure to check out current specials for more great reasons to visit Pinehurst Inn Bed & Breakfast and Bayfield.